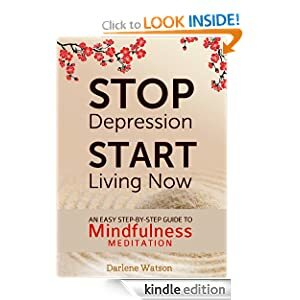 Stop Depression, Start Living Now is a complete and easy guide to fight your depression with mindfulness meditation. Mindfulness meditation is a proven method to reduce depression and now everyone can learn how to do this with the help of this book. *	How to live a life full of freedom and joy. Depression affects millions of men, women, and children around the world and many are left without much hope, even after therapy and medication. If you have ever wrestled with depression, it is important that you know that there is hope in a technique called mindfulness meditation. Mindfulness simply means being mindful, or aware of your present state of feelings, body functions, and thoughts. Researchers have been studying the effects of mindful meditation on depression and are finding that it can bring freedom to sufferers once and for all. Drawing from Eastern meditation tradition, mindful meditation teaches people to gain control over their thought life. It is no secret that the mind can be full and always racing with thoughts that can cause all sorts of negative emotions. All the way from anger to fear to extreme sadness, negative emotions can reek havoc on an individual’s life. As you practice mindful meditation and learn the magnificent power of your breath, negative and painful thoughts will slowly subside and more and more peace will enter your mind. You will notice less and less depression and more and more joy. Other chapters included in the book give insight into how depression hurts, a detailed guide on how to practice mindful meditation, the power of the breath, using guided imagery as an aid, various mindfulness research, and how you can learn to manage your emotions better via meditation. The book can be of great help for anyone new to mindfulness meditation and suffering from a depression. However there are life lessons in it for all of us. Drs. Darlene Watson is a mental health professional now for over 15 years. With over 5 years experience in both depression and treating this with mindfulness meditation, she brings the depth of her understanding to her teaching in a rational way. Next to being a mom, writing about her profession is her passion. She lives in Connecticut and has a BS in Psychology and a MA in counseling.